In an echo of last year’s Green Innovation Grant awards, this year’s GIGs continue to reflect the campus community’s interest in growing food and shrinking the Bates waste stream. 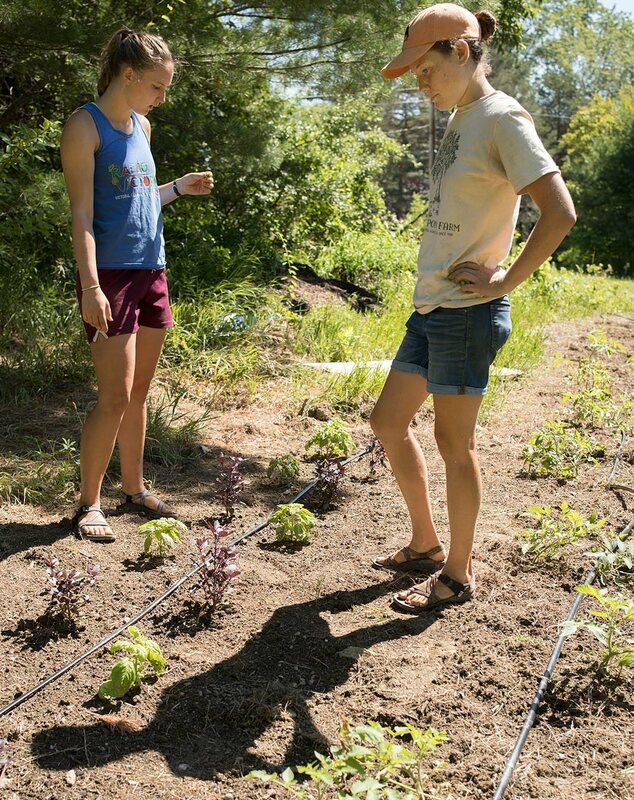 Of the $10,000 in grants awarded by Bates’ Committee on Environmental Responsibility, $4,000 will support infrastructure improvements to the Plot, the Bates fruit and vegetable garden established last year with an initial GIG and additional support from Dining Services. Another $2,700 will fund projects that, in various ways, will expand recycling and reduce the amount of refuse Bates sends to the Lewiston landfill. See the sustainability projects being funded this year by Green Innovation Grants. One waste-trimming project funded for 2019 is an extension of an older initiative that wasn’t GIG-funded. Launched by Bates staff about a year ago, the project brings a social-engineering approach to the problem of minimizing throwaways: It replaces standard wastebaskets in certain campus buildings with much smaller receptacles. “The hope is to create more awareness that much of what ends up in the waste stream is actually recyclable,” says Travis Gould, an assistant professor of physics and chair of the CER. Gould proposed the 2019 project, which will supplant wastebaskets with “mini-bins” that hook side-saddle onto, or even into, recycling receptacles. 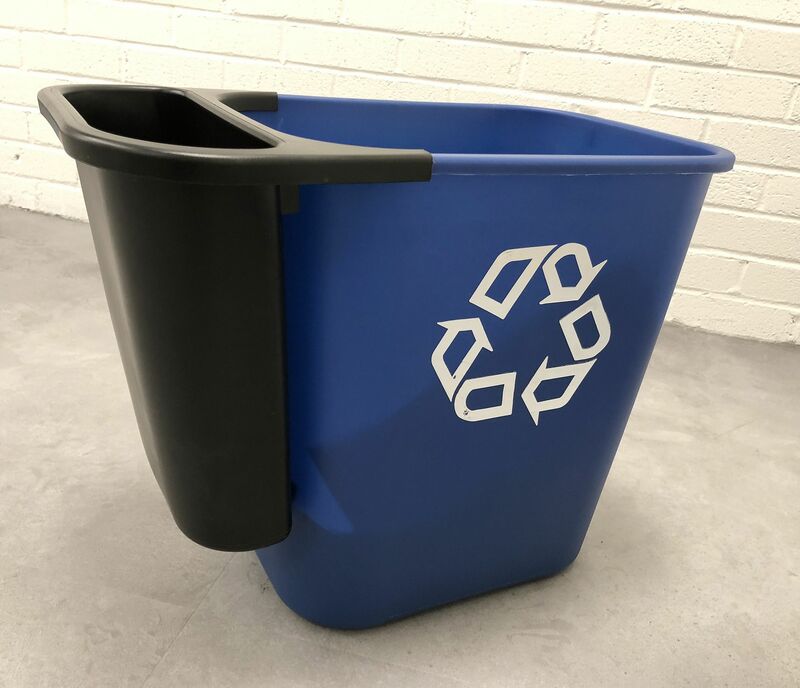 The side-saddle trash receptacle attaches to a traditional blue recycling basket. The $1,000 project could result in as many as 100 of the side-saddle bins replacing their full-size siblings on campus. The concept was initiated and proven in a slightly different form last year by Lori Larsson, then a member of the Information and Library Services staff. She introduced quart-sized “tiny trashcans” in Ladd Library and elsewhere, and their success led Sarah Bernard ’75 of Human Resources and other employees to do likewise throughout their offices. As for the Plot, Green Innovation Grants will pay for the construction of a shed and the installation of a permanent water feed from a nearby Bates-owned house. The shed will afford secure storage of tools and supplies that, last year, were stockpiled on wooden pallets under tarps. Replacing a long concatenation of hoses crossing field and forest from the Bates house to the Plot, the underground pipe will provide a low-fuss, reliable supply of water to the garden’s irrigation system, which consists of drip lines that snake throughout the garden beds. For sustainability manager Twist, the emphasis on recycling and the garden in the GIG proposals is telling. “It’s sort of a peoples’ movement thing,” he says. “Anyone can get involved in recycling. Anyone can help out with the garden. 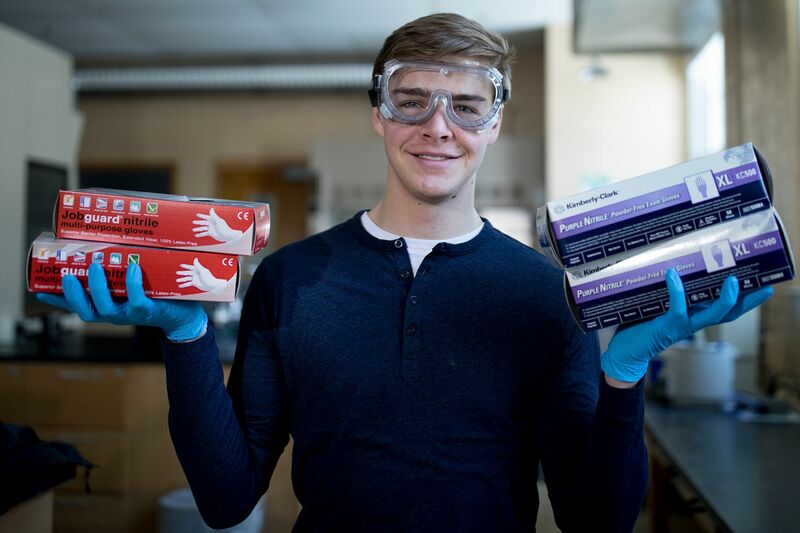 Proposals (three combined): Create a system for sending hard-to-recycle products — such as disposable lab gloves, beauty products, snack wrappers, and CDs/DVDs — to TerraCycle, a New Jersey company that processes such difficult recyclables. Goal: Increase the scope and quantity of recycling at Bates. Proposal: Expand the Tiny Trash program. Goal: Use the visual cue of small trash receptacles paired with large recycling bins to divert refuse away from the waste stream and into recycling. Proposal: Install water fountains and bottle filling stations in Carnegie Science Hall. Goal: Reduce use of disposable water bottles and encourage healthy hydration (this will complete a GIG-funded project proposed last year). Proposals (two combined): Build a tool shed and permanent water supply for the Plot, the college vegetable garden. Goal: Improve efficiency of garden infrastructure.